An East End Legacy is a memorial volume for William J Fishman, whose seminal works on the East End of London in the late nineteenth century have served as a vital starting point for much of the later work on the various complex web of relations in that quarter of the capital. 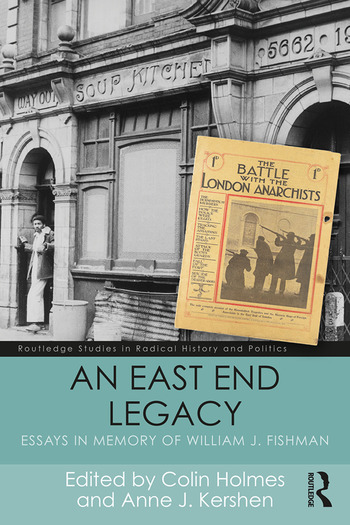 A variety of leading scholars utilise the insight of Fishman’s work to present a wide range of insights into the historical characters and events of the East End. The book’s themes include local politics; anti-alienism, anti-Semitism and war; and culture and society. In pursuing these topics, the volume examines in great depth the social, political, religious and cultural changes that have taken place in the area over the past 120 years, many of which remain both significant and relevant. In addition, it illustrates East London’s links with other parts of the world including Europe and America and those territories "beyond the oceans." This book will prove valuable reading for researchers and readers interested in Victorian and twentieth century British history, politics and culture. Colin Holmes is Emeritus Professor of History at the University of Sheffield, UK. Anne J. Kershen is Honorary Senior Research Fellow at the Centre for the Study of Migration,Queen Mary University of London and Honorary Senior Research Associate at the Bartlett School of Architecture, University College London.